The surface of the Dead Sea is the lowest point on the Earth's surface as measured from sea level at about 412 meters below the Geoid.2 The Dead Sea is a salt lake with no outlet, so its surface level fluctuates significantly with inflow and evaporation. The Challenger Deep in the Mariana Trench is the deepest point on the Earth's ocean floor as measured from sea level at 10,911 meters below the Geoid.2 The Challenger Deep is more than 23% deeper than Mount Everest is high. The surface of the Arctic Ocean at the North Pole is the closest point on the Earth's surface to the Earth's center of mass at 6,356,752 meters.4 The Arctic Ocean at the North Pole is covered by sea ice and snow most of the year, but the sea water opens occasionally in late summer. 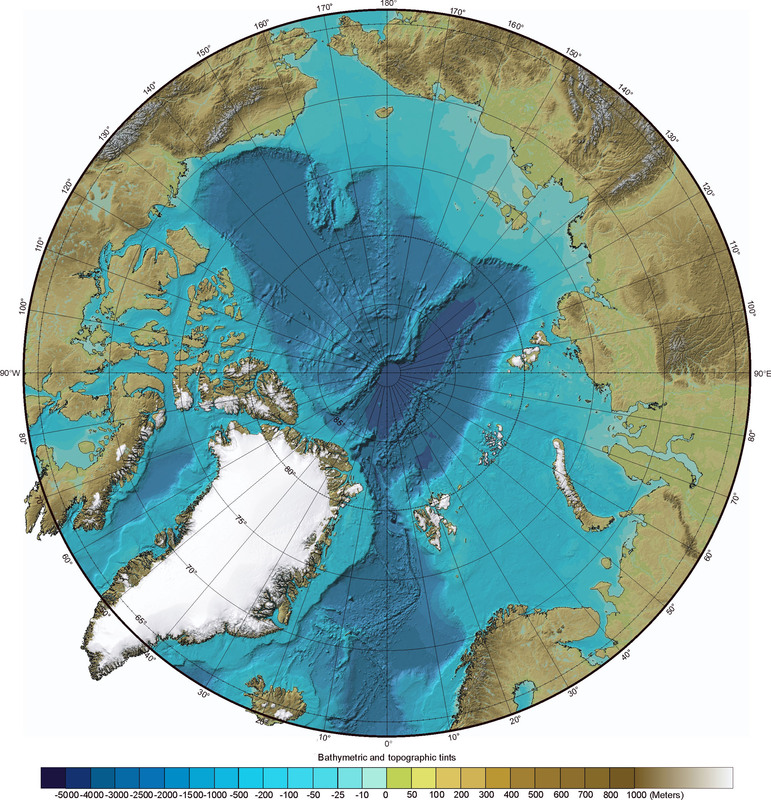 The Polar Deep in the Amundsen Basin is the closest point on the Earth's ocean floor to the Earth's center of mass at approximately 6,352,300 meters.4 The Polar Deep is near the North Pole, but its exact location and depth have yet to be determined. Note 3: An independent state of Palestine has been proposed, but not established. Note 4: The Earth is oblate, i.e., fatter around the equator than at the poles. Eurasia is the most extensive landmass on Earth with a total surface area of 54,517,197,000,000 square meters (54.5172 Tm2 = 11.7% of the Earth's surface). Eurasia has both the Earth's highest surface point of 8,850 meters above mean sea level at the summit of Mount Everest as well as the Earth's lowest surface point of 412 meters below mean sea level at the Dead Sea. Eurasia is also the most populous landmass with more than 4,200,000,000 human inhabitants. Eurasia has historically been considered to be two continents, Asia and Europe, because of its tremendous area. Eurasia is connected to the continent of Africa by the Isthmus of Suez. Greenland is the most extensive island on Earth with a total surface area of 2,130,800,000,000 square meters (2.1308 Tm2). Greenland has fewer than 60,000 human inhabitants. Manitoulin Island is the Earth's most extensive island situated in a lake with a total surface area of 2,766,000,000 square meters (2.766 Gm2). Java is the most populous island on Earth with more than 120,000,000 human inhabitants. Devon Island is the most extensive uninhibited landmass on Earth with a total surface area of 55,247,000,000 square meters (55.247 Gm2), but no human inhabitants. New Guinea is the tallest island on Earth with a maximum elevation of 5,030 meters above mean sea level at the summit of Puncak Jaya. Isla Ometepe is the Earth's tallest island situated in a lake. Volcán Concepción (1,576 m), the taller of the two volcanos on Ometepe, rises about 1,544 meters above the surface of Lago de Nicaragua (Lago Cocibolca) (32 m). Hispaniola has the lowest surface point of any of the Earth's ocean islands with a maximum depression of about 46 meters below mean sea level at Lago Enriquillo. The Grand Canyon is the most voluminous dry canyon on Earth with a volume of 4,100,000,000,000 cubic meters (4.1 Tm3). Barranca del Cobre is the most voluminous dry canyon system on Earth with a total volume of 16,000,000,000,000 cubic meters (16 Tm3). A temperature of 330.87 kelvin (57.7°C = 135.9°F) recorded on September 13, 1922, at Al ‘Aziziyah, Libya, is the highest ambient air temperature every recorded at the surface of the Earth. A temperature of 183.95 kelvin (-89.2°C = -128.6°F) recorded on July 21, 1983, at the Vostok Station, Antarctica, is the lowest ambient air temperature every recorded at the surface of the Earth. An average yearly ambient air temperature of 307.55 kelvin (34.4°C = 93.9°F) makes Dalol, Ethiopia, the warmest place at the surface of the Earth. An average yearly ambient air temperature of 216.75 kelvin (-56.4°C = -69.5°F) made the Plateau Station, Antarctica, the coolest place at the surface of the Earth. The Plateau Station was operated by the United States from December 1965 to January 1969. Many scientists feel that the coldest temperatures on Earth occur in the vicinity of the Plateau Station. An average yearly precipitation of 11.872 meters (467.4 inches) makes the village of Mawsynram, India, the rainiest place on Earth. An average yearly precipitation of 0.8 millimeters (0.03 inch) makes the port city of Arica, Chile, the least rainy place on Earth. The Pacific Ocean is the most voluminous body of water on Earth with a volume of 674,052,000,000,000,000 cubic meters (674 Pm3), approximately half of all water on Earth. The Pacific Ocean is also the most extensive body of water with a surface area of 164,015,000,000,000 square meters (164.015 Tm2 = 32.2% of the Earth's surface), and the deepest body of water with a maximum depth of 10,911 meters. The Caspian Sea is the most voluminous lake on Earth with a volume of 78,200,000,000,000 cubic meters (78.2 Tm3). The Caspian Sea is also the most extensive lake on Earth with a surface area of 374,000,000,000 square meters (374 Gm2). The Caspian Sea is a landlocked remnant of the Mesozoic Tethys Sea which also encompassed what are today the Mediterranean Sea, Black Sea, and Aral Sea. Lake Baikal is the most voluminous body of fresh water on Earth with a volume of 23,000,000,000,000 cubic meters (23.0 Tm3). Lake Baikal is also the deepest lake on Earth with a maximum depth of 1741 meters and an mean depth of 730 meters. Lake Michigan and Lake Huron form the most extensive body of fresh water on Earth with a surface area of 117,318,000,000 square meters (117.32 Gm2). Although usually considered two separate lakes, Lake Michigan and Lake Huron maintain a consistent surface level and are thus two lobes of one common lake. The Amazon has the greatest flow of any river on Earth with an average discharge rate of 219,000 cubic meters per second into the Atlantic Ocean. The Amazon has the largest drainage basin of any river with an area of 6,915,000,000,000 square meters (6.915 Tm2). The Nile is the longest river on Earth with a total length of 6,695 kilometers from the source of the White Nile at Lake Victoria to the Mediterranean Sea. Salto Angel is the tallest waterfall on Earth with an uninterrupted drop of 807 meters and a total drop of 978 meters. Canada has the longest coastline of any country with an total length of 202,080 kilometers (more than five times the circumference of the Earth!) Canada and the United States share the longest common land border with a total length of 8,893 kilometers. The People's Republic of China is the most populous country with more than 1,300,000,000 human inhabitants. China also has the longest land borders of any country with a total length of 22,117 kilometers. China is one of only two nations that border fourteen countries: Afghanistan (76 km), Bhutan (470 km), Burma (2,185 km), India (3,380 km), Kazakhstan (1,533 km), North Korea (1,416 km), Kyrgyzstan (858 km), (Laos 423 km), Mongolia (4,677 km), Nepal (1,236 km), Pakistan (523 km), Russia (3,645 km), Tajikistan (414 km), and Vietnam (1,281 km). The Democratic Republic of Timor-Leste is purportedly the poorest country with an estimated per capita annual gross domestic product of $400 PPP1 in 2004. The Federal Democratic Republic of Ethiopia is the most populous landlocked country with more than 73,000,000 human inhabitants, but no ocean access. The Republic of Kazakhstan is the most extensive landlocked country with a total surface area of 2,717,300,000,000 square meters (2.71730 Tm2), but no ocean access. The Principality of Liechtenstein is one of only two nations that are doubly landlocked.2 Liechtenstein borders two other landlocked countries: Austria (34.9 km) and Switzerland (41.1 km). The Grand Duchy of Luxembourg is the wealthiest country with a per capita annual gross domestic product of $58,900 PPP1 in 2004. Luxembourg is a very fortunate landlocked country. The Republic of Maldives has the lowest mean elevation of any country at 0.8 meter above mean sea level. The maximum elevation in the Maldives is only 2.4 meters above mean sea level. The 2004 Indian Ocean Tsunami inundated most of the Maldives. A rising sea level could force the evacuation of the Maldives and many other low lying regions of the Earth. The Principality of Monaco is the most densely populated country with 16,620 persons per square kilometer in 2005. Mongolia is the most sparcely populated country with 1.78 persons per square kilometer in 2005. The Russian Federation is the most extensive country with a total surface area of 17,075,200,000,000 square meters (17.0752 Tm2). Russia is one of only two nations that border fourteen countries: Azerbaijan (284 km), Belarus (959 km), China (3,645 km), Estonia (294 km), Finland (1,340 km), Georgia (723 km), Kazakhstan (6,846 km), North Korea (19 km), Latvia (217 km), Lithuania (227 km), Mongolia (3,485 km), Norway (196 km), Poland (206 km), and Ukraine (1,576 km). The United States of America has the largest economy of any country with an annual gross domestic product of $11,750,000,000,000 PPP1 in 2004, about 21% of the gross world product. The United States and Canada share the longest common land border with a total length of 8,893 kilometers. The Republic of Uzbekistan is one of only two nations that are doubly landlocked.2 Uzbekistan borders five other landlocked countries: Afghanistan (137 km), Kazakhstan (2,203 km), Kyrgyzstan (1,099 km), Tajikistan (1,161 km), and Turkmenistan (1,621 km). Note: A region is said to be doubly landlocked when all adjoining regions lack ocean access.